This tutorial will show you step by step how to electronically fill in and sign PDF forms and documents without printing and scanning them – in a few different ways using free software and apps – on a Windows 7, 8 and 10 PC, and on an Android phone. There are companies, ad networks and affiliate networks that require you to fill in and sign PDF forms and documents and then email it back to them. Usually, you have to fill in all kinds of information about yourself, like your name, nationality, birth date, phone number, email address, address, zip code (postal code), city or town, state, country, etc. You could print out the document, fill it in, sign it, scan it and then email it back. The easy and quick way would be to electronically fill out and sign PDF forms and documents so that you don't need to print and scan them. You can sign your document with an electronic signature (also called e-signature), and it's an image of your signature overlaid on top of a PDF form or document. In the Windows 10 Fall Creators Update, Microsoft Edge allows you to easily electronically fill and sign PDF forms and documents. 1. Right-click on the PDF file. 2. Go to Open with and then click on Microsoft Edge. 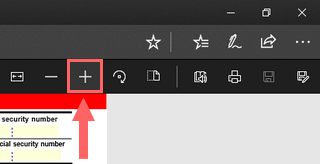 Or if you use Microsoft Edge as your standard PDF viewer, then you can double-click on the PDF file. 3. 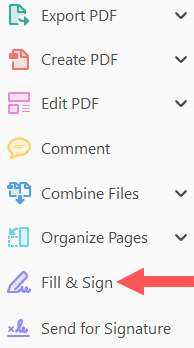 If the PDF form appears too small, then click on the PDF form and then click on the + icon at the top to zoom in. 4. To fill in the form or document, you click with your mouse cursor on a field (line) and type your information (e.g., given name, family name, etc). 5. To sign the form or document, you click on the pencil icon at the top right. 6. Click on the ballpoint pen icon and select the right font color and size (for signature). 7. Draw your signature in the signature field (left click, hold and draw). If the drawing doesn't work, then you will need to click on the Touch writing icon at the top right. If you're not happy with your signature, then click on the eraser icon at the top right, click on the signature to erase (you might need to click and swipe a bit) and then click again on the eraser icon at the top right. 8. When you're finished typing or drawing your signature, you right-click on the PDF file and choose Save as. 9. Select a location on your computer where you want to save your PDF file and click on Save. You can download Adobe Acrobat Reader DC here (official Adobe website). Note: don't forget to uncheck the optional offers before clicking the Install now button. Tip: Make a copy of your file before you start. 1. Open Adobe Acrobat Reader DC. 2. Click on File at the top left and choose Open. 3. Go to the location on your PC where the PDF form or document is stored you want to fill in or sign. 5. Click on Fill & Sign located in the right panel. 6. To fill in the form or document, you click with your mouse cursor (indicated with |Ab) on a field (line) and type your information (e.g., name, address, etc). 7. To sign the form or document, you click on Sign located in the toolbar just above your PDF file and choose Add Signature or Add Initials. 9. When you're finished typing, drawing or adding your signature, you click on Apply. 10. 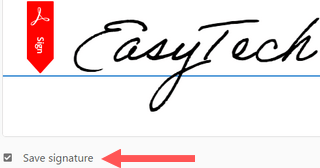 Now drag your signature to the signature field (line) (often indicated with Sign Here) of your form or document. 11. If you want your signature to be saved, then leave Save Signature checked, so that you can easily and quickly add this signature to future documents. 12. When you're finished filling in and signing your PDF form or document, you click on the save button at the top left. You can also click on File at the top left and choose Save. 13. 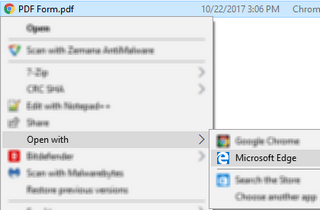 Select a location on your computer where you want to save your PDF file and click on Save. You can download Foxit Reader here (official website). 2. Click on File at the top left. 5. Go to the location on your PC where the PDF form or document is stored you want to fill in or sign. 6. Select the PDF file and click on Open. 7. If the PDF appears too small, then you can zoom in at the bottom right. 8. To fill in the form or document, you click on Typewriter in the top toolbar, then click on the field (line) and type your information (e.g., country, state, etc.). 9. To sign the form or document, you click on PDF Sign in the toolbar, then click on the + button. 11. When you're finished typing, drawing or adding your signature, you click on Save. 12. Now drag your signature to the signature field (line) (often indicated with Sign Here) of your form or document. 13. Click on Apply All Signatures at the top toolbar. 14. If you want to proceed, you click on Continue Applying. 15. When you're finished filling in and signing your PDF form or document, you click on File located at the top left. 16. Click on Save As. 19. Select a location on your computer where you want to save your PDF file and click on Save. You can download Nitro PDF Reader here (official website). 1. Open Nitro PDF Reader. If the Nitro Reader Quick Start Guide appears, you check the Do not show at startup option and click on Close. 7. Click on Home next to File at the top left. 8. To fill in the form or document, you click on TypeText in the top toolbar, then click on the field (line) and type your information (e.g., city, postal code, etc.). Note: If you want to sign the document after you filled it in, then you will need to click on Home again. 9. To sign the form or document, you click on QuickSign in the toolbar. Note: If you don't see QuickSign, then you will need to click on Home at the top left. 11. When you're finished typing, drawing or adding your signature, you click on OK.
12. Now drag your signature to the signature field (line) (often indicated with Sign Here) of your form or document and click on Apply. 14. 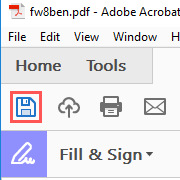 When you're finished filling in and signing your PDF form or document, you click on File at the top left. 15. Click on Save As. 17. Select a location on your computer where you want to save your PDF file and click on Save. You can download PDF-XChange Viewer here (official website). 2. Click on Open at the top left. 5. To fill in the form or document, click with your mouse cursor on a field (line) and type your information (e.g., first name, last name, etc). 6. To check a checkbox, you click on it. 7. To sign the form or document, click on Tools in the top menu, go to Comment And Markup Tools, go to Pencil Tool and choose Default Style. 8. Go to the signature field of the form/document and draw your signature. 9. When you're finished filling in and signing your PDF form or document, you click on File at the top left and choose Save As or Save Copy As. 10. Select a location on your computer where you want to save your PDF file and click on Save. This will work on almost all Android smartphones, such as Samsung Galaxy, Sony Xperia, Lenovo, Huawei, Xiaomi, OnePlus, Oppo, HTC, and LG. 1. Open the Adobe Fill & Sign app. 2. Tap on the file and + icon. 3. Tap on From PDF File. 4. Go to the location on your phone where the PDF form or document is stored you want to fill in or sign. 5. Tap on the PDF file. 6. To fill in the form or document, you tap on a field (line) and type your information (e.g., phone number, email address, address, etc.). 7. To sign the form or document, you tap on the pen icon located at the top and choose Create Signature. 8. Draw your signature on the screen. If you make a mistake and want to start over again, then tap on Clear at the bottom right. 9. When you're finished drawing your signature, you tap on Done at the top right. 10. Tap again on the pen icon and then tap on your signature. 11. Drag your signature to the signature field (line) (often indicated with Sign Here) of your form or document. 12. When you're finished filling in and signing your PDF form or document, you tap on the share icon at the top right next to the pen icon. And maybe a few other options, depending on the apps you have installed on your Android smartphone. 1. Open the DocuSign - Upload & Sign Docs app. 2. Tap on the + button. 3. Tap on the + button at the bottom right. 6. Tap on SIGN NOW at the bottom. Your document will now be uploaded to DocuSign and after that, it will show your document. 7. To fill in the form or document, you tap on a field (line), tap on Text (pop-up menu), drag the text field to the right position, and then type your information (e.g., first name, last name, etc.). 8. To sign the form or document, you tap on the signature field (line) and then tap on Signature (pop-up menu). Draw your signature > draw your signature and when it's finished and you're satisfied with it, tap on the check mark located at the top right. If you want to draw a new one, then tap on Clear. 10. Drag your signature to the signature field (line) (often indicated with Sign Here) of your form or document. 11. When you're finished filling in and signing your PDF form or document, you tap on FINISH. 12. Now a pop-up window will appear to ask you if you want to send this document after signing. Either way, your document will be saved. Tip: You might want to save your document to Drive or send by email so that you will have a backup of the document. To do this, tap on your document and then tap on SHARE at the bottom right. 1. Open the Foxit PDF Reader & Editor app. 2. Open the PDF form or document you want to fill in or sign. 3. To fill in the form or document, you tap on your document and then tap on Comment from the pop-up menu that appears at the bottom (if the pop-up menu disappears, then you will need to tap on the field again). 4. Tap on the (T|) icon from the pop-up menu that appears at the bottom (if the pop-up menu disappears, then you will need to tap on the field again). 5. Type your information (e.g., name, date of birth, etc.). 6. When you're finished typing, you tap on the document to close the keypad (keyboard). 7. Tap on the text you just typed. 8. Drag the text to the right text field. 9. If you want to edit the text, then tap on Edit, edit your text and tap on your document to close the keypad (keyboard). 10. If you want to change the font, font size, color or opacity, then tap on Appearance, change the font, font size, color or opacity and tap on your document to close the keypad (keyboard). 11. To sign the form or document, you tap on your document and then tap on Sign from the pop-up menu that appears at the bottom (if the pop-up menu disappears, then you will need to tap on the field again). 12. Tap on the black dot at the top right and change the thickness to 2px. 13. Draw your signature and when you're finished drawing your signature, you tap on the save icon at the top right. 14. Tap on the signature field of your document and your signature will appear. 15. If you want you can change the size of the signature. 16. Tap on Add Signature. 17. A pop-up window will appear and here you tap on OK and all changes will be saved.